Anton Dvorak was an undisputed leader of the Czeck symphony. He composed several symphonies and operas. He was familiar with choral mass composition. In 1890 he accepted a commissioned work - a requiem - to be performed in Birmingham in 1891. 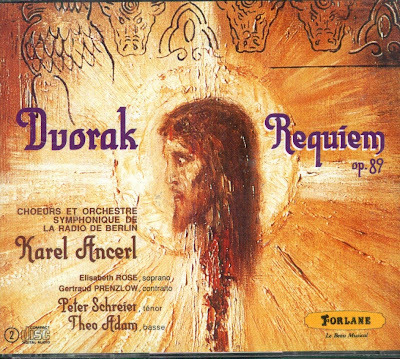 Dvorak's requiem is a dramatic composition, more intended for a concert performance rather than for liturgical purposes. The Compact Disc (2 CD) was released by Forlane, 1991, (ADD).